Community Combined Ministries (CCM) is a Christian faith based ministry and a 501(c)3 non-profit organization. Under the CCM umbrella is (KPP) Kidz Power Pacs. 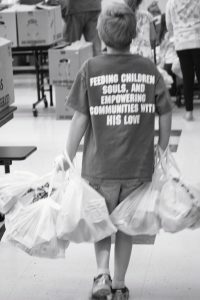 This special weekend feeding ministry serves on average 900+ children / 40 schools in Berkeley and Jefferson Counties West Virginia. DID YOU KNOW… During the 2016 – 2017 school year KPP served 240,870 meals and 137,640 sides in weekend bags, 83,700 meals during holiday breaks and 40,500 meals during the summer months for a total of 502,710 meals/sides served. Would you like to help this special ministry? Sponsor a child, host a fundraiser or help in another way? Thank you for your continual prayers, love and support.